This time of year is busy, and I’m not just talking about Christmas. It’s the end of the year, and for us working moms, that means completing projects at work before the end of the year, prepping for year-end reviews, budgets, and planning for the year ahead. 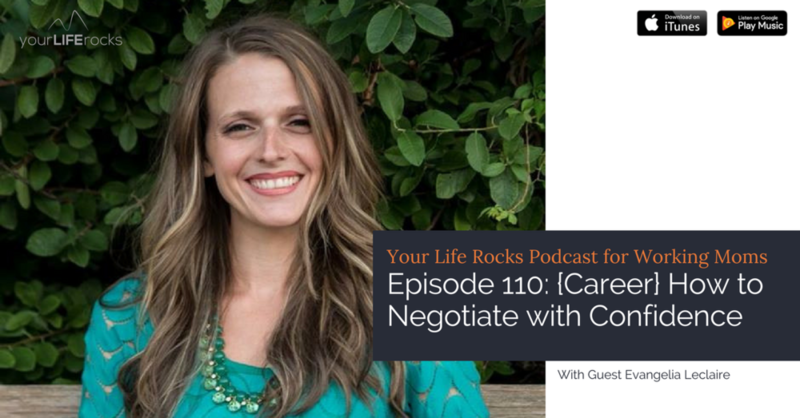 In this episode, I’m joined by career strategist Evangelia Leclaire who shares strategies to help you gain confidence and be ready to negotiate for a raise, more time off or a flexible schedule. Evangelia is the Founder of Career Ready Set Rock and helps powerful, purpose-driven women make more moves, money and meaning in their lives and careers. Although Evangelia is a career strategist who swears by strengths assessments and action plans, she believes that the greatest life blessings and lessons come from being present, surrendering and having faith. 1. Take inventory of the equity you have built with the company, department, your boss, and your team. Going forward, create a folder or board on Trello to save all your kudos and evidence of performance. It makes this process a lot easier. 2. Get clear on what’s important/expected to the business. What do you think will be important to the business in the next year? 3. Go in with the mindset of agreement. Look for a win win.